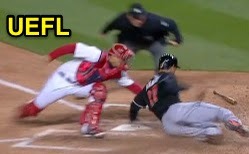 Instant Replay Review overturned 1B Umpire DJ Reyburn's No HR call in the top of the 2nd, upheld Reyburn's HR call in the bottom of the 4th and confirmed HP Umpire Dan Bellino's out call (Rule 7.13 home plate collision non-call) in the top of the 8th inning of the Marlins-Nationals game. In the 2nd, with one out and one on, Marlins batter Derek Dietrich hit a 1-1 changeup from Nationals pitcher Jordan Zimmerman to deep right field and the top of the outfield wall. Upon Instant Replay Review as the result of a request by Marlins Manager Mike Redmond and initiation by Crew Chief Jeff Kellogg, Reyburn's ruling that the ball struck the top of the wall and remained in play was reversed, the call was incorrect. At the time of the review, the Marlins were leading, 4-0. In the 4th, with one out and two on, Nationals batter Bryce Harper hit a 3-2 fastball from Marlins pitcher Brad Hand to deep right field and past the foul pole. Upon Instant Replay Review as the result of a request by Marlins Manager Redmond and initiation by Crew Chief Kellogg, Reyburn's ruling that the ball left the playing field in flight and in fair territory was affirmed, the call was correct. At the time of the review, the Marlins were leading, 5-3. In the 8th, with one out and two on, Marlins batter Garrett Jones hit a 0-1 fastball from Nationals pitcher Tyler Clippard on the ground to right fielder Jayson Werth, who threw to second baseman Anthony Rendon to catcher Jose Lobaton as Marlins baserunner R1 Giancarlo Stanton arrived at home plate. Upon Instant Replay Review as the result of a request by Marlins Manager Redmond and initiation by Crew Chief Kellogg, Bellino's ruling that Lobaton did not violate Rule 7.13 and legally tagged Stanton while Stanton was off his base was affirmed, the call was correct. At the time of the review, the Marlins were leading, 7-6. The Nationals ultimately won the contest, 10-7. These are DJ Reyburn (80)'s 1st and 2nd Instant Replay Reviews of 2014. This is Dan Bellino (2)'s first Instant Replay Review of 2014. DJ Reyburn is now 1/2 (.500 Affirmation Rate) in Replay Reviews during 2014. Dan Bellino is now 1/1 (1.000 Affirmation Rate) in Replay Reviews during 2014. Crew Chief Jeff Kellogg's crew is now 2/3 (.667 Affirmation Rate) in Replay Reviews during 2014. These are the 58th, 59th & 60th Instant Replay Reviews of the 2014 MLB Regular Season. Marlins Manager Mike Redmond is now 1/4 (.250 Success) in Instant Replay Reviews during 2014. Umpires are now 41/60 (.683 Affirmation Rate) in Instant Replay Reviews during the 2014 MLB season.